.:Soul:. is Colorful at We Love Role-Play for May! | .:Soul:. .:Soul:. is Colorful at We Love Role-Play for May! I think I overdid the colors again. Wait… Yeah.. wait… NAH! Who am I kidding? The more colors the better! With so many things included in each, I’m glad I put it on the textures! That is a LOT to type! All of these are available at We ❤ RP and if you buy the Fatpack, you get two Exclusive sets! We ❤ Role-Play Birthday Gift! DUH. Rainbows! Aptly named too! We ❤ Role-Play opens May 4th! This entry was posted in Appliers, Events, Female, Head Appliers, Male, New Releases, Skins, Uni Ears, Unisex, We <3 RP! 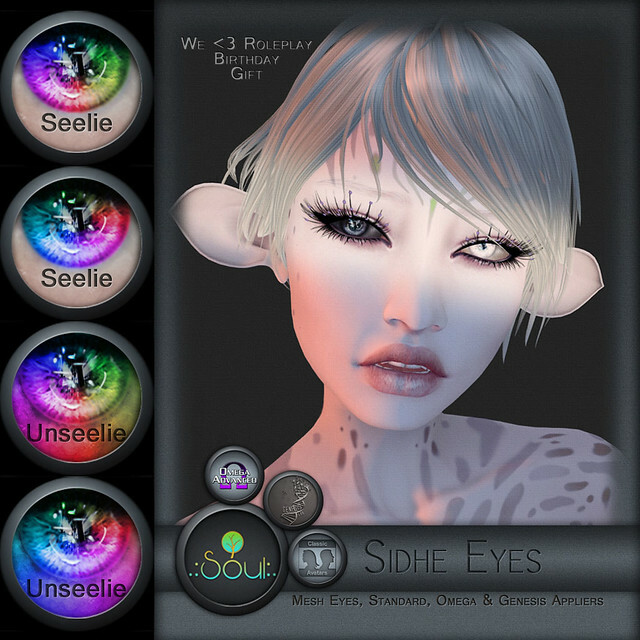 and tagged Adam, Androgenous, Appliers, Birthday, Bubblegum, Catwa, eyes, Fae, fairy, fantasy, Female, Genesis, Gift, gold, Lelutka, Lemon, Lemonade, male, May the Fourth, Nails, physique, Pink, rainbow, Role Play, roleplay, Sidhe, Signature, skins, SLINK, unisex, We <3 Roleplay, We love roleplay, Yellow. Bookmark the permalink. ← .:Soul:. @ FANTASY FAIRE!!!! I was excited to see these skin colors teased, and that excitement hasn’t diminished now that I own them. Doesn’t hurt that they are colors I had really hoped to see released (not that the existing skin lines are lacking in variety or anything, but having just the right skin color can make or break a certain look or avatar theme).